This is the coolest ride ever!! 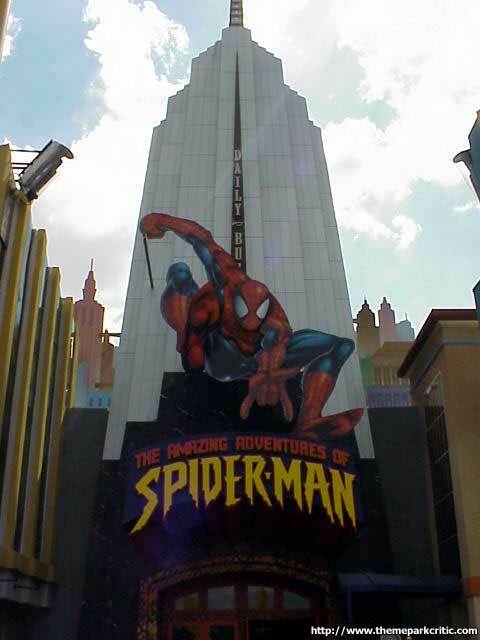 DO NOT visit Islands of Adventure without going on this! You WILL NOT be disappointed! I love coasters...my mom hates them....and we both LOVED this ride! You just cant explain how awesome this ride is...you need to experience it! This ride is so great. It is even better than most coasters are. I hope more of these are made soon. IT RULES!!!!! This ride was AWESOME! I really liked the effects and the special things that happened during it. I liked the water spray parts and the "falling 25 stories" part which both were definitely a plus. The reason why its 9 not 10 was because some of the effects werent going and some were different "I rode this two times and the second time, the first water part didnt spray at all"
overall, I think it did great though! A truly awesome ride. Quite possibly the best virtual ride anywhere. The 3-d affects are mind boggling. The heat, cold, and fire affects were awesome as well. Last but not least, the drop off the building was done so well that I actually thought I was falling off a building in New York! A very good ride with a detailed queue worth at least 1 ride anytime your at Islands of Adventure. This is a great ride,I go on it every trip to IOA. Ive been on it so many times that I have practically memorized the whole attraction. The only reason this ride gets a 9 is because the queue is always an hour or more and some of the effects dont always work. AMAZING!! In my opinion, it is the best of all dark rides. I got my brother, who hates rollercoasters, to go on it. It is really the only ride I go on with him. This and the Hulk are the best at Islands of Adventure. Fun Fun Fun Fun!!!! I cant explain it, it must be ridden to be believed! Fun Fun FUN FUN!!! Skip Disneydump and go to Universal!! The only thing like it in the entire world. It is the unique combination of thrill ride and 4-D movie that make this the best dark ride in America. The entire experience is awesome, the movie is great, the theming is awesome, the first time I rode it I was speachless when I came off. I still dont know how they do some of the things they do on this ride. I mean the feeling of freefalling is awesome, especially since you are barely moving. I just cant say enough about this ride. The best 3-D ride in the U.S.! Go Universal IOA!! !That was soooo cool when it looked like you are dropping, and the buildings look as if you are falling! and how the mivies in front of you are perfectly placed to look soooo real! I can see how this ride might displease 6 5" people (see the ground, not good) but overall this is so cool! I remeber when I got off, I was in shock at what I had just experienced. But when I got out of my trance, I was like, "That was SOOOOOOOO AWESOME!!!" 1,000,000 OUT OF 10!!! The shining gem of a boring and small park. This was really awesome and fun! I would even go so far as to say the possible future of rides to come. Be prepared, though, it will make you a little queezy if you dont go in expecting it. Its a 3-D ride that makes you really feel like youre flying and falling. Can freak you out and make ya a little sick if you dont expect it. But, heck! Ride it anyway! Its too awesome not to.